Exploring new territories and creating new memories are some of the reasons why I keep on traveling. It is somewhat weird on my part that I started to travel around Asia but haven’t been to one of the closest ones from the Philippines. 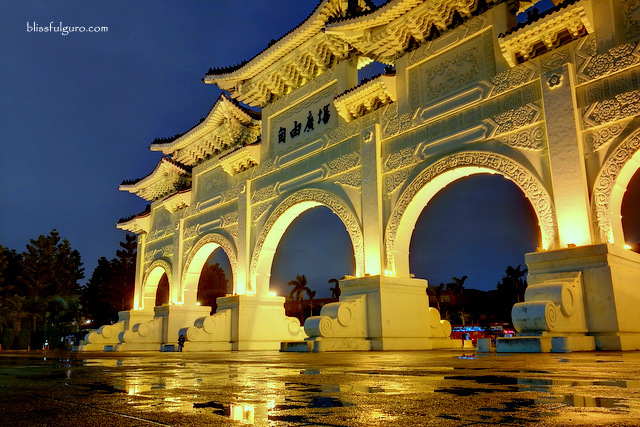 Taiwan (Republic of China) is geographically near the country but the strict visa policies on entering it made it a major hindrance for Filipinos. 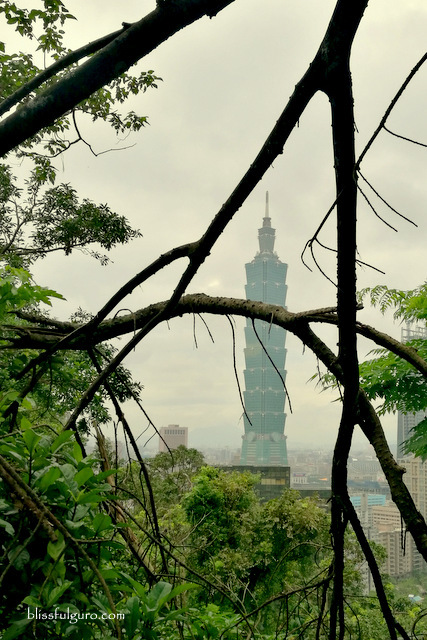 With the new Taiwan visa exemption for the Philippines, it paved way for me and my buddies to visit our closest neighbor and enjoy our short weekend jaunt around key destinations in Taipei. And because it's 16 degrees, sunbathing it is! Arriving at Taoyuan International Airport from our uber late flight (there are many direct flights from Manila to Taipei), we were welcomed by our chauffer from the limo service of our hotel. Grand Hyatt Taipei was the basecamp for our Taipei adventure. 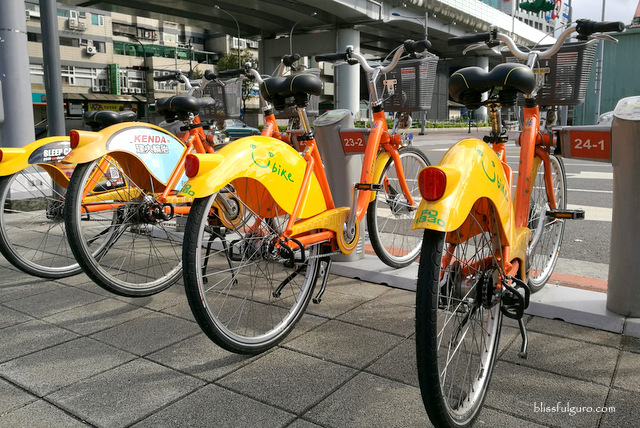 Located at the city center, its close proximity to Tapei 101 (it’s just across the street) made it a good springboard to our walking trips (check here for discounted tours, transportation and activities in Taipei). 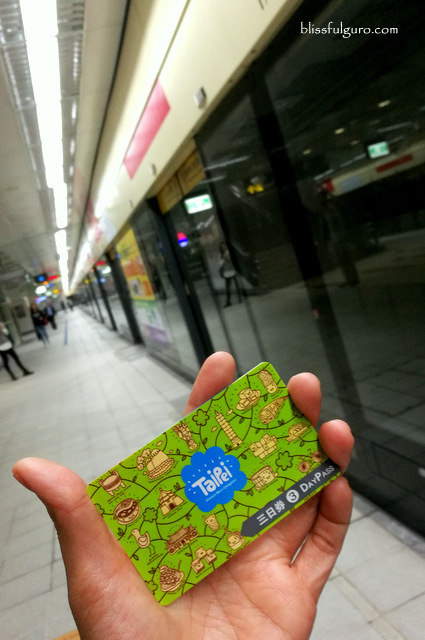 Downtown Taipei’s public transportation is very efficient and easy to explore especially since they have day passes that provide tourists with unlimited access to the MRT (Taipei Metro) and downtown buses for a very reasonable price. 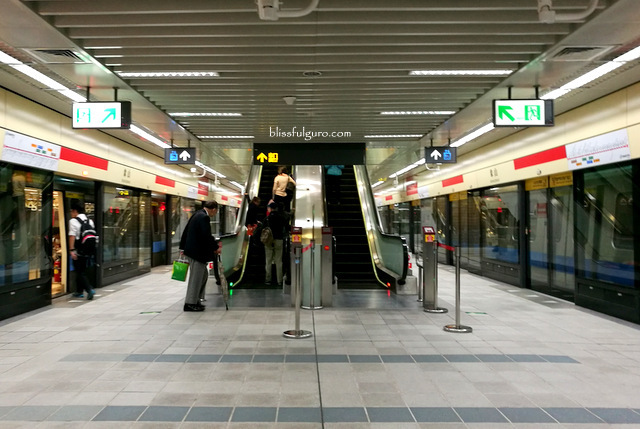 We got an unlimited MRT ride for three days (NT380 | US$11.92) at the information counter of a certain station. The pass allowed us unlimited access to all 108 stations of the five main color-coded routes. It surely saved us time on buying single tickets every time we take the subway train. What I noticed during our countless MRT rides was that the toilets in all the stations were very clean and stocked up with toilet papers (something you could only dream about happening in the Philippines) and each one has its own theme, depending on the significance of the place. One other thing I noticed was the courtesy umbrella stand wherein you can freely get umbrellas as long as you place it back on any station after you're done with it. Quite clever and very convenient. 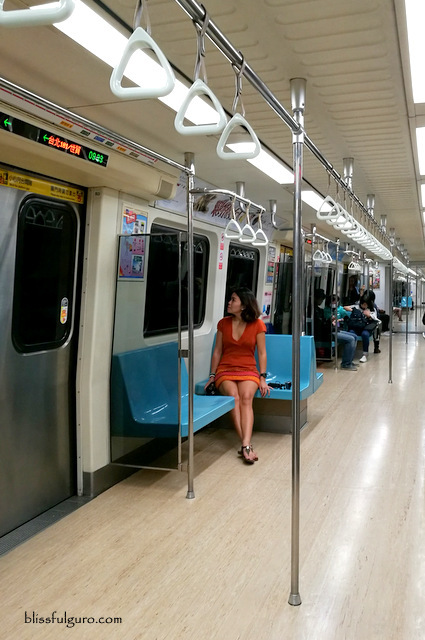 The subway system in Taipei is comparable to that of Singapore and Hong Kong, but I love Taipei Metro more. With regard to currency exchange, I always bring US Dollar with me when I travel abroad and exchange some loose bills at the airport (if needed) and try to search for good conversion rates afterwards at the city center. In the case of our Taiwan trip, I didn't need to exchange some at the airport as we had an arranged pick-up from the hotel. We didn’t find any money changer at the city center but we did exchange our money on a bank that had better rates than those in the airport (US$1 = NT31.59). From 6 am to 12 mn, I had unlimited access to MRT for three days! I never research prior any trip and leave the nitty gritty part of plotting a rough plan to my buddy. Surprisingly, my buddy drafted a very well-planned three-day itinerary for this trip leaving just one site unvisited because of weather conditions. Old village feels, that’s what my buddy told me when I asked him about our first stop. Arriving at MRT’s Beimen Station (green line), we treaded its almost empty roadways to search for Datong District. There’s a park right beside a temple filled with preschoolers who seemed to be having fun with their snacks while locals were rushing to eateries for their breakfast fix. My friends flocked on one of the eateries and got lost in translation at the menu list. I sat on a chair on the outside dining area and people-watched. 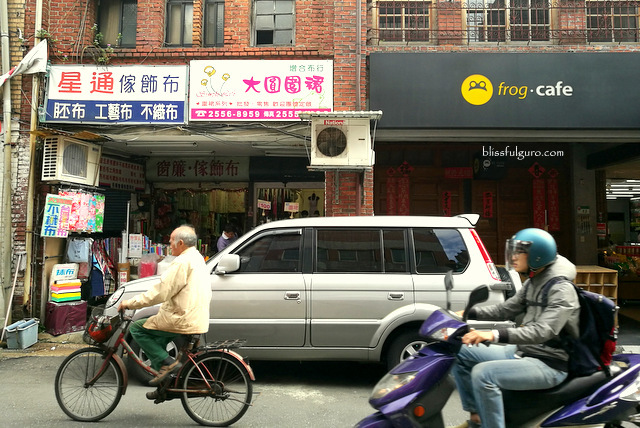 After their meal, we followed the oldest thoroughfare in the whole of Taipei, Dihua Street. Old shop houses that sell all sort of stuff lined the street. 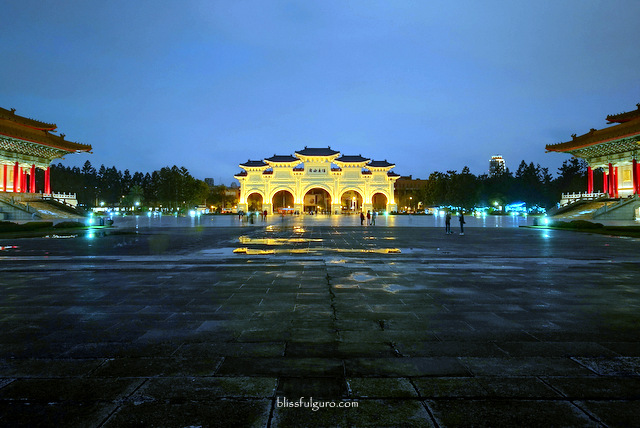 I love the vibe of Datong District, with the charm of an old village and the fascinating Taiwanese knick-knacks. A morning beer sesh would’ve been perfect but we needed to move on. 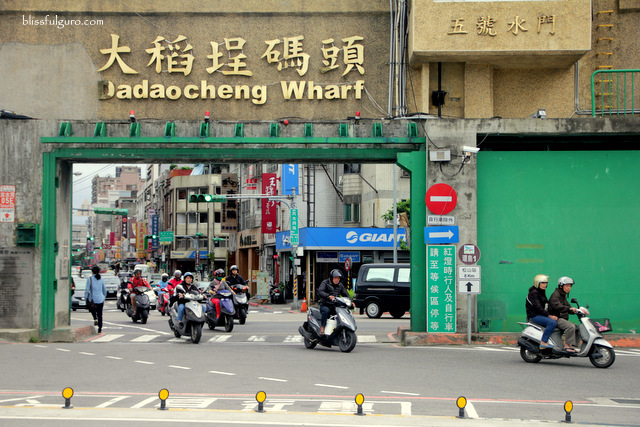 We walked further and found an entryway to the Dadaocheng Wharf where we lounged for a while until our next stop. 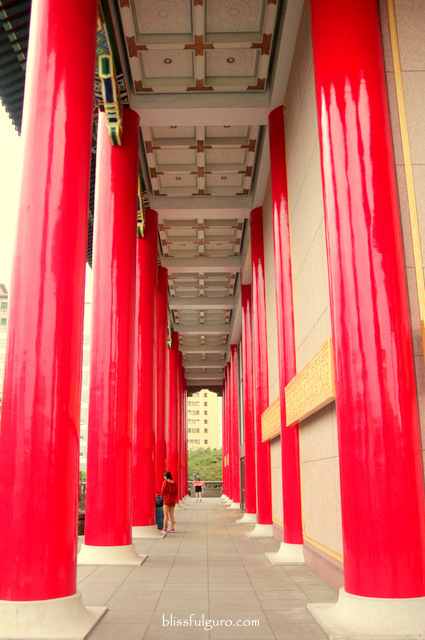 I heard that Taipei is a shopping haven, and we had to experience it. We alighted at MRT’s Ximen Station (blue or green line) and were transported into an urban jungle as we reached the exit. 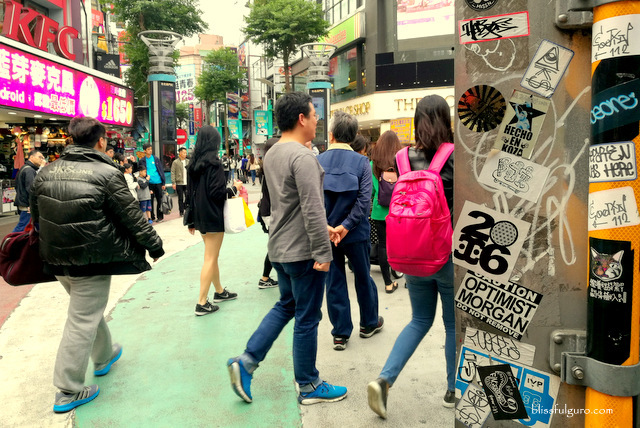 Countless shopaholics (or may be onlookers) flooded the streets around Ximending area. Some of my buddies went inside the biggest H&M store in Asia while me and my non-shopaholic buddies strolled around the different alleys in search for bargain hunts. Bags, shoes, gadgets and other stuff were sold on the shops that dominated the area. 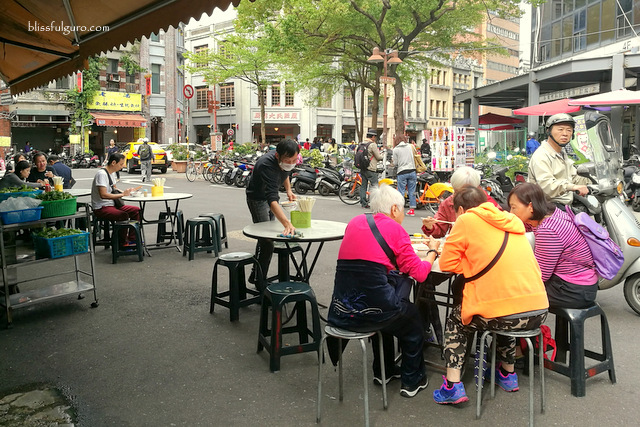 Hawker stalls were also available for those who want to sample Taiwanese street food. We had a strict time to follow though so as to appreciate the next spot. 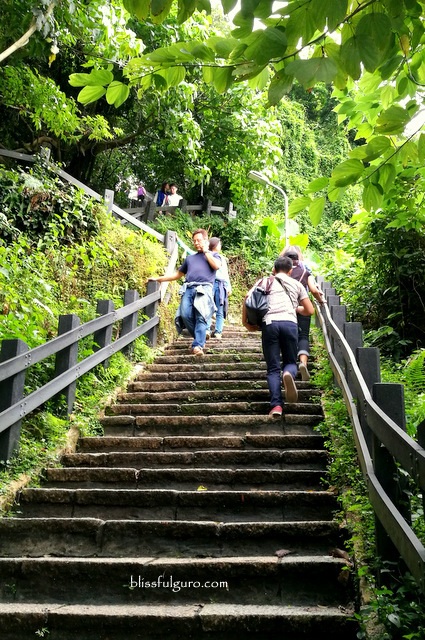 We arrived at MRT’s Xiangshan Station (red line) at half past three in the afternoon and started to look for the trail going to the mountain. It was easy as there were lots of signages that pointed us to the right direction. The uphill ascent on a quiet village signaled the onset of our hike. The extreme combination of chilly weather and humongous mosquitoes made hiking such a punishment (and have I told you that I totally detest any form of hiking unless needed?). In the middle of the trail I sat on a bench while waiting for my buddies. The view there was already amazing so I kept on cheering myself up to get to the top for a much better view. Halfway to the top, and I'm already tired. We passed by some rocky area that was filled with selfie legends. I went further and spotted a viewing deck. Realizing that the best spot was still a kilometer away or so, we decided to remain here. I sat on a bench, still catching my breath, as my buddies chose their particular spots to capture the golden and blue hour. I veered away and went back to the rocky area where the sun was actually starting to set. 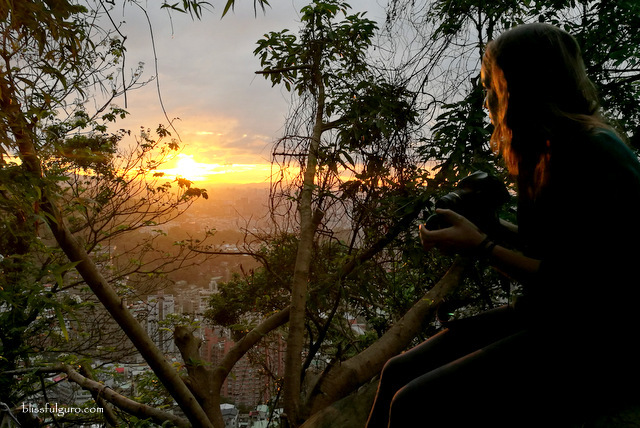 I found a huge rock in the middle of the lush trees on which I settled, waiting for the majestic sunset over Taipei. I took some snaps and was engrossed by the beauty of it. It was quiet, serene and beautiful. Ready, set up your tripods, shoot! I went back to where my friends were, realizing that I missed a whole lot of beautiful sun-kissed Taipei 101 photos, it was okay though as I just had a quiet me time. 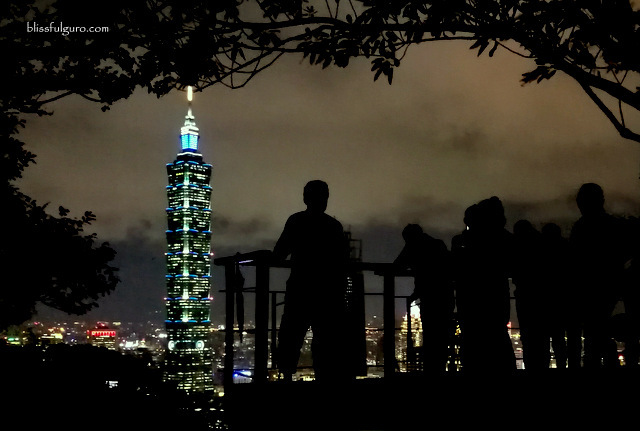 We spent an hour or so capturing the nightscape until all of us felt our grumbling stomach, we hurriedly climbed back down and headed to the nearest night market. My buddies didn’t adhere to our eight a.m. call time the next day, the chilly Taipei morning keeping them tucked on their beds until I admonished them to prep up. 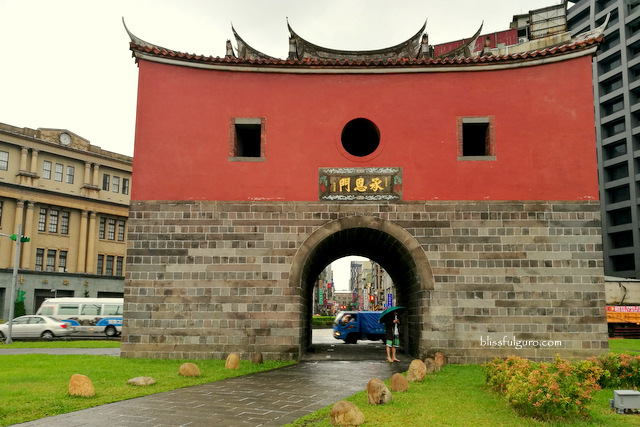 It was the day when our itinerary pointed us to the outskirts of Taipei City. 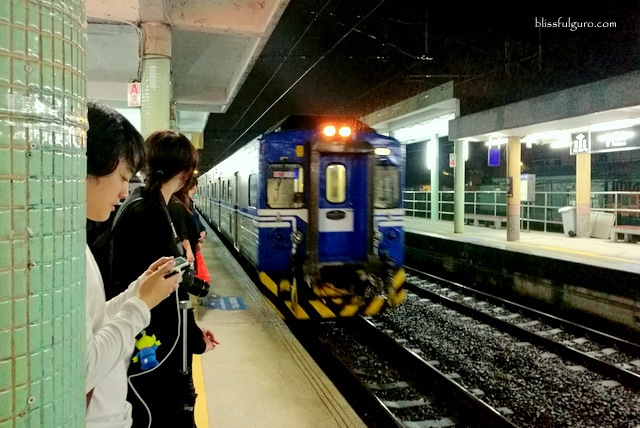 We got off at MRT’s Taipei Main Station (red or blue line) where provincial trains and buses are located. We went to the East Parking Lot where the bus to Jiufen was parked and paid exactly NT96 (US$3) for the trip (make sure you have exact change to put in the fare box next to the driver). The one and a half-hour bus ride was smooth and comfy. 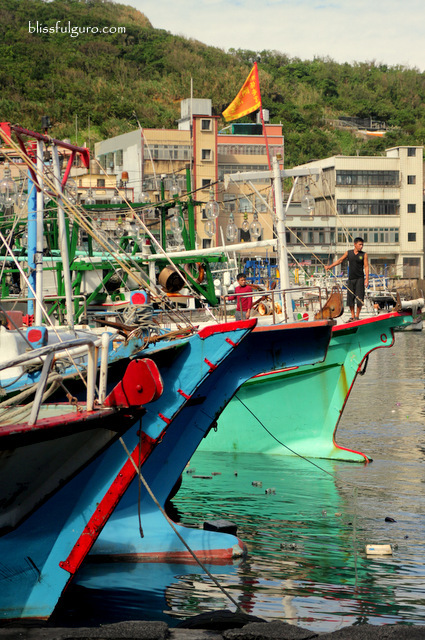 One of my buddies exclaimed that the fisherman’s wharf at Yehliu was where the family of Sancai relocated in the hit series Meteor Garden. We all laughed as we started to trace back some of the scenes in our mind. We went further and found a huge parking lot with loads of tourists heading to Yehliu Geopark. We’re doomed, I thought, as looking for the perfect spot to take photos without them obstructing the view would be a problem. We paid NT80 (US$2.51) for the entrance fee and went ahead to the paved walkway to the seaboard. 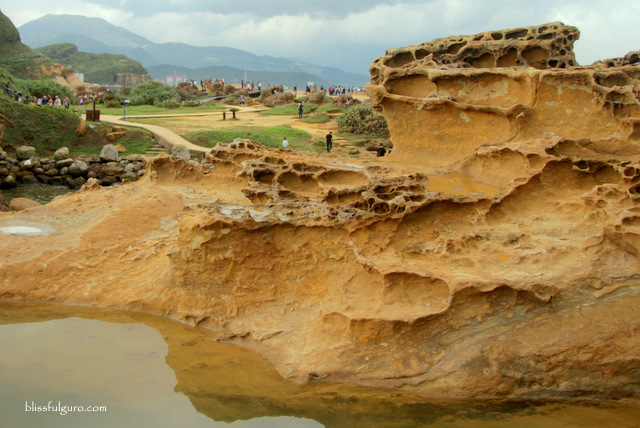 Located at Wanli District of New Taipei, Yehliu Geopark is a cape known by geologists as the Yehliu Promontory. 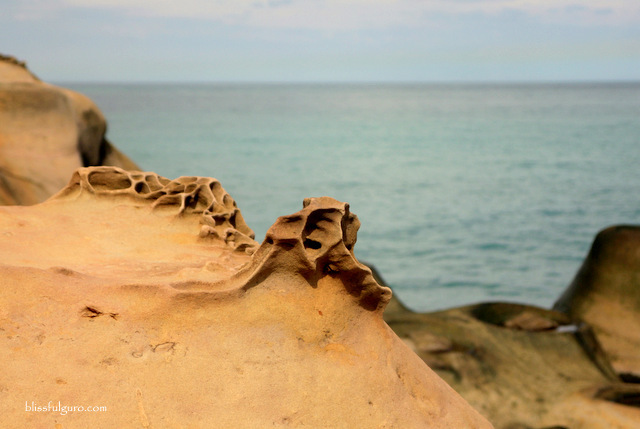 Unique geological formations and potholes can be found here. 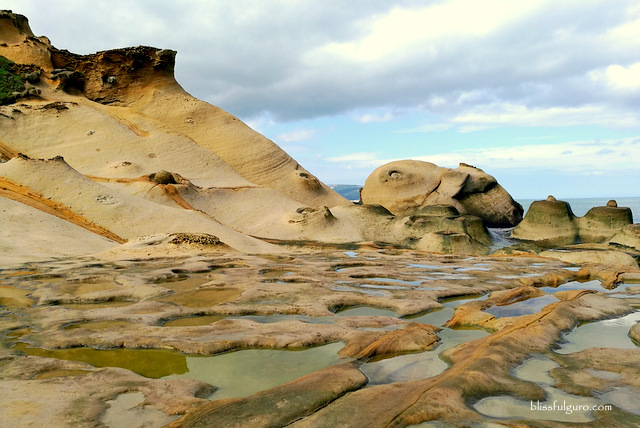 The marvelous rock formations can be compared to those we have in the Philippines such as the Kapurpurawan Rock Formation in Ilocos Norte except for the influx of tourists. I deviated from where the people were and went to the farthest end where the limit for visiting was set. Later, I learned that this specific part is on the western end of the first area where Candle Rocks (as they named it) are located. I sat on one of the potholes and watched as the huge waves endlessly crashed into the rocks. I enjoyed this wonderful scenery with a lone photographer who was meticulously setting up her tripod to capture this marvel. We literally escaped the crowd. I joined my friends and explored the other side of the park where the crowd grew bigger. It was okay though as the vastness of the whole park provided so much space to move around. Visit early in the morning, like 8:00 a.m.
We were two hours behind our schedule and sadly couldn’t proceed to our next destination, the Elephant Rock. 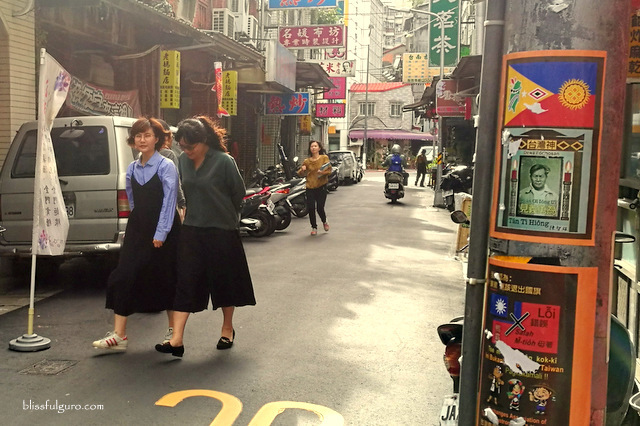 We also decided to just rent a cab for NT1,200 (US$37.65) to go to Jiufen instead of shuttling on two different buses (Jiufen to Keehlung to Jiufen) to move faster. 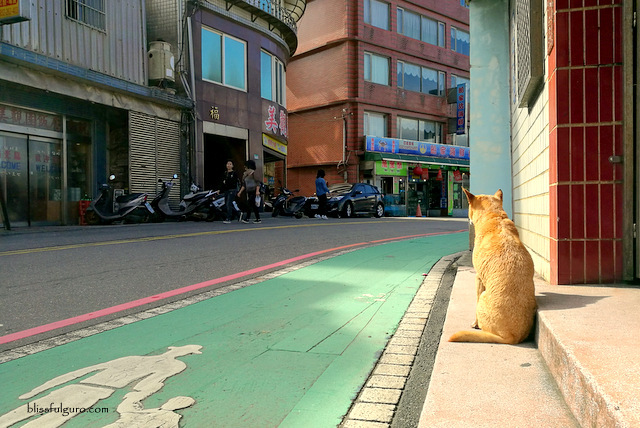 We watched a classic Taiwanese movie A City of Sadness before we left for this trip. 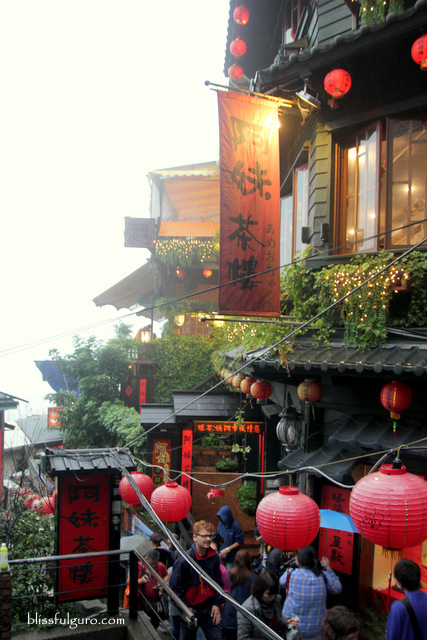 Some scenes from the award-winning film were shot at Jiufen which is an hour away from Taipei City. The place was a thriving gold mining town until the 1950’s when mining was discontinued. It was drizzling when we arrived at the bus stop. We started the hike up and climbed a few flights and found ourselves on a yard where people converged. Restaurants, tea houses and shops surrounded the small square. 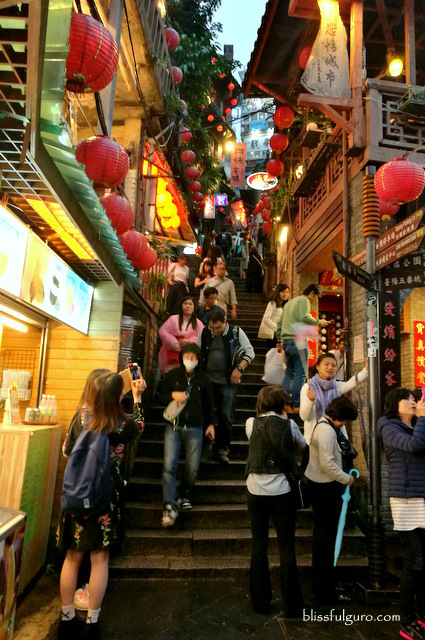 The main narrow uphill alley was the spot where visitors take their time for that perfect selfie and such. I noticed how orderly the people were as they formed a single line and waited for their turns to either go up, down or take a selfie. I climbed up the steps and noticed a familiar place, where some scenes of the film were shot. It felt weird as the whole place looked and felt like I was transformed into an old village but also felt that commercialism has slowly taken over the place. As we advanced to the top, the crowd and shops grew bigger. But still, everyone’s well-ordered. We reached the top and found that almost everything was covered with mist. 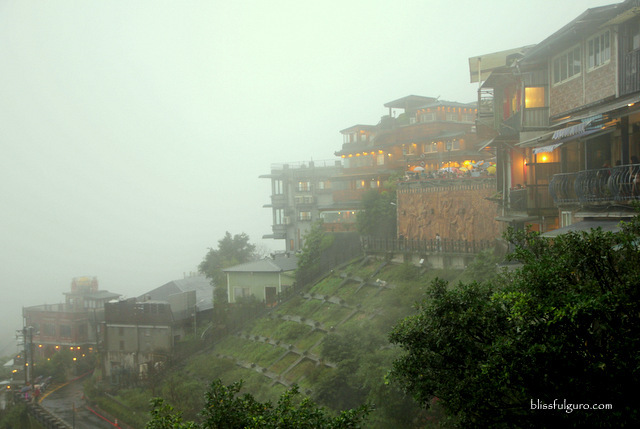 It was dreamlike and romantic as heavy clouds passed over the houses and shops perched on the hill. Unfortunately, It was also covering the great view of the Pacific Ocean. 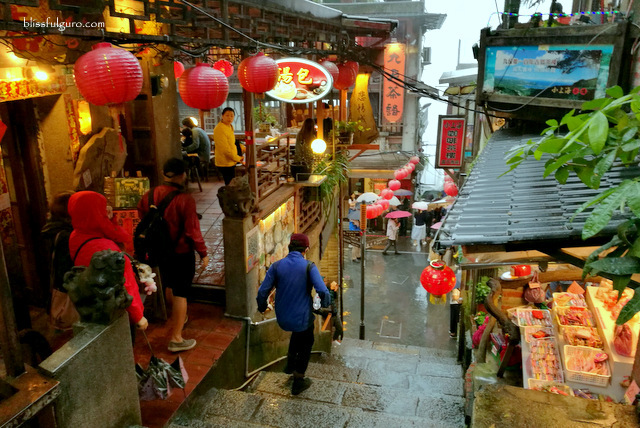 We also watched an award-winning Japanese animated film, Spirited Away, which was said to have gotten its inspiration for the setting from Jiufen. I couldn’t vouch for the authenticity of the story but the location is rather similar. The souvenir shops around were also bombarded with souvenirs from the said movie. I love the vibe at Jiufen. Next time, I hope to spend a night or two here and enjoy the place without the crowd. 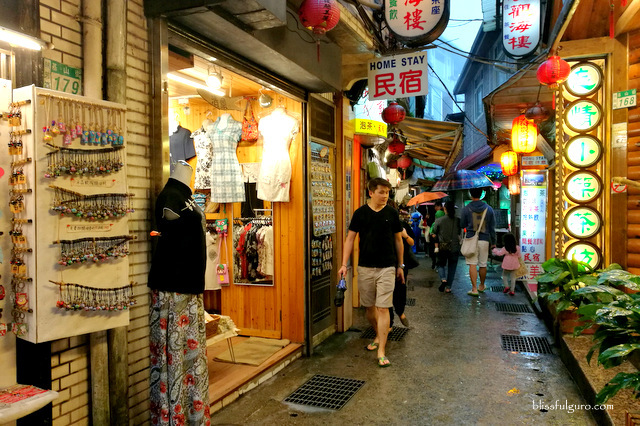 Getting out of Jiufen can be tricky as direct buses to downtown Taipei is hard to find. A nice Taiwanese guy mentioned that we could ride a bus heading to Ruifang for NT15 (US$0.47) and then take the local train to the city for NT49 (US$1.54), which was what we did. 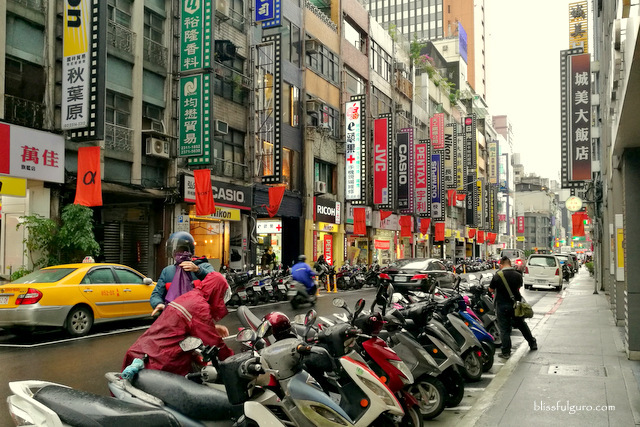 It took us almost an hour to finally reach downtown Taipei (keep the train ticket for inspection) and searched for our next night market for some great food. We dedicated our last day on our individual missions. Some went to a museum while others chose to catch up with sleep. 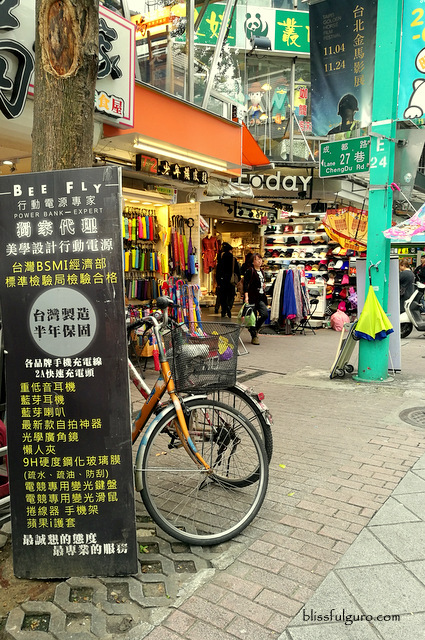 Me and my buddy couldn’t pass our last day without exploring other parts of downtown Taipei so we headed to a certain mall which we heard is a techie-haven and went to MRT’s Zhongxiao Xinsheng Station (blue or orange line). Well, I’m not really into gadgets but my buddy was searching for a camera lens which he heard might be cheaper in Taipei compared to Manila. We had no luck looking for the lens but scored some super bargain micro SD cards and flash drives which were three times cheaper at Guang Hua Digital Plaza. My buddy went on with his lament on getting a new lens and so we went to MRT’s Beimen Station (green line) for our next destination. Apparently, there’s an area dedicated for cameras and other photography gear which is called the Camera Street. It had an old city feel to it as old signages of famous camera brands were displayed on century-old buildings, a utopia for photography enthusiasts. We combed each and every shop for that elusive lens, to no avail. We found great deals on other camera brands but didn’t have that extra money to splurge. So we sauntered on. Arriving at MRT’s Chiang Kai-shek Memorial Hall Station (red or green line), we were met with a heavy downpour (as we got reunited with the rest of the gang) that almost made us quit and go back to the hotel. But my friends insisted that we could wait for sunset as the blue hour will paint the sky beautifully, which what basically had happened. My eyes were glued on the Honor Guards as they marched their way to the flagpole. They went on with the observance of flag retreat. I joined all the other visitors who became instant spectators to this one-of-a-kind experience. We went into our separate ways as dusk covered Taipei. 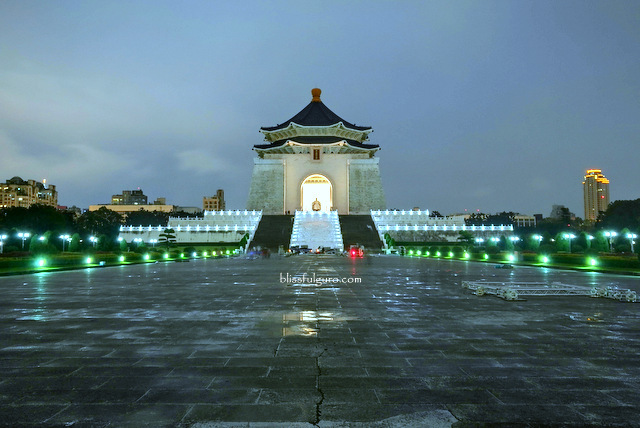 Some went inside the memorial hall while others proceeded to take snaps of the gates. I chose to stay at the flagpole and sat on one of its balustrades. That moment of contemplation and lone time was just too lovely, and then it dawned on me that hours from now, we will be leaving soon. 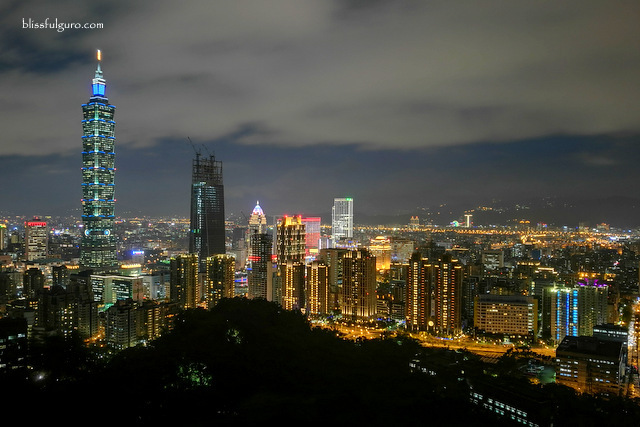 Being the tallest building in the world from 2004 to 2010 (beating Kuala Lumpur’s Petronas Towers), it’s quite a popular landmark for first-time travelers in Taipei. Grand Hyatt Hotel, our home in Taipei, is just right across the road but sadly, we didn’t have time to check out what’s inside the structure or at least get a decent photo of it. 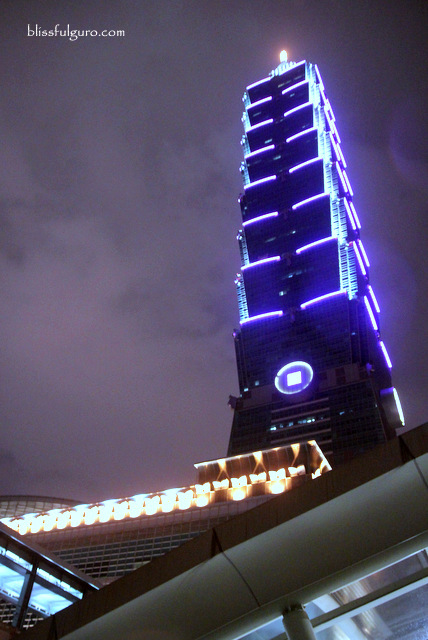 My memories of Taipei 101 were those mornings waking up and seeing it from the glass windows of our living room and using MRT’s Taipei 101 World Trade Center Station (red line) as our main hub on going around town. When I mentioned Taipei to my friends, they drool over as they mention the ultimate street food scene at night markets. 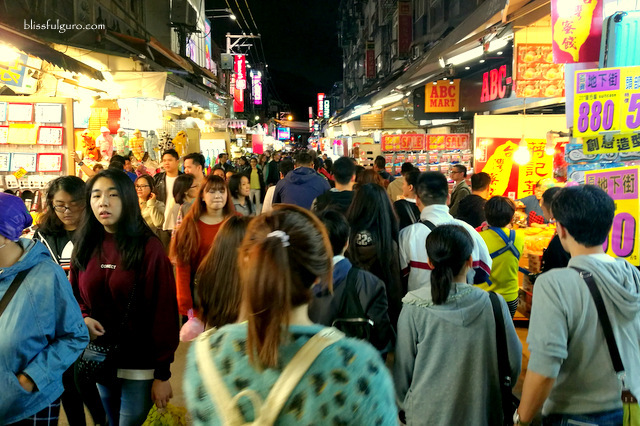 If you try to search online for night markets, you’d easily find one nearby, wherever you are. But that same friend suggested that we should not miss Shilin Night Market as well as the Raohe Night Market. 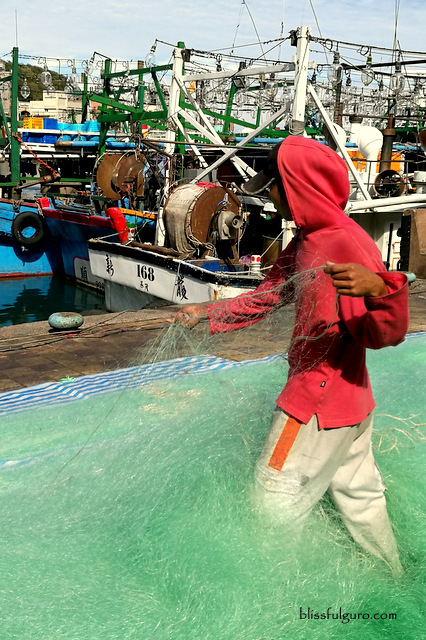 We had three full days to spare and we had a quota of one night market per day. 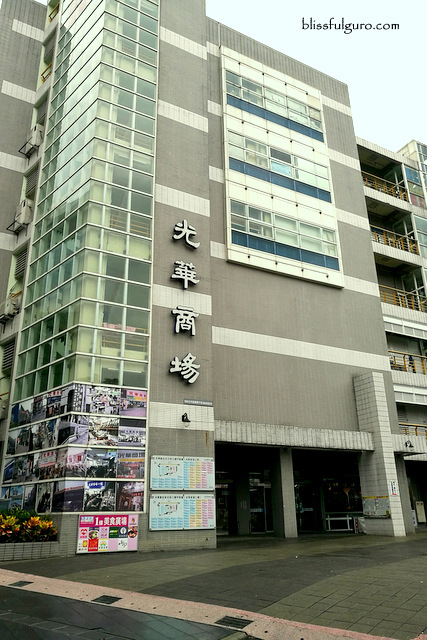 Coming from Elephant Mountain, we alighted at MRT’s Shilin Station (red line). There were signs leading to the said market that we followed. We weren’t sure if we’re heading the right way because the road we’re passing by was extremely quiet, no signs of any mayhem, up until we reached the war zone. Thousands, or may be tens of thousands, filled the narrow streets surrounding the area. 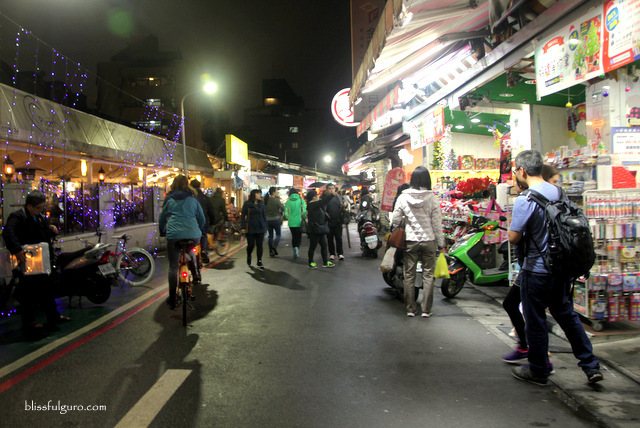 Shilin Night Market is generally organized as food stalls and eateries were smacked on one corner while other shops were located on different areas. We were so famished that we sat on one of the eateries and ordered whatever they had before we carried on with battling the crowd. My buddies enjoyed shopping while I took pleasure in sampling various street food around. Super tired from our very first day, we looked for a bar or may be a shack that sells beer but found none. Our beer sesh that night was postponed. 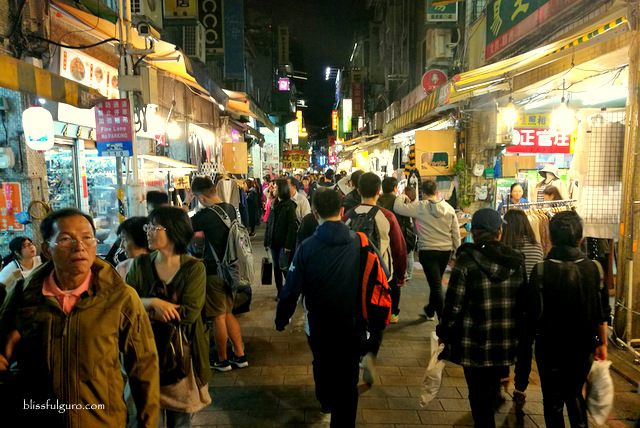 Coming from the outskirts of downtown Taipei, we were dead tired as we reached MRT’s Songshan Station (green line) for the second installment of our night market stint. It was drizzling as we arrived at Raohe Night Market. Again, we were as hungry as the other night so we immediately searched for a place to eat. After which, we headed for window shopping. This certain market is different from Shilin. The streets were wider and everything’s more organized. There were also some carnival game stations wherein one of my buddies played pinball and balloon dart game. We capped off the night on a beer shack along Songhe Street and spent the rest of the night chitchatting about the highlights of the day’s events. Our flight for Manila was set at one in the morning. So instead of chilling out somewhere, we chose to explore another night market nearby. 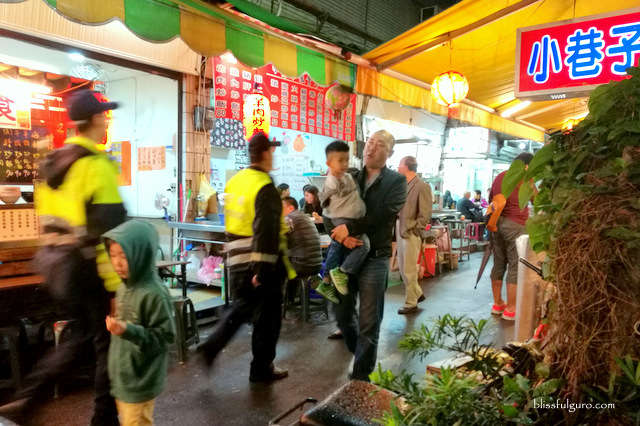 We alighted at MRT’s Taipower Building Station (green line) and searched for our last night market trip in Taipei. Shida Night Market was way different from the other two we visited. It had this lazy Sunday Market vibe where no one’s rushing around. 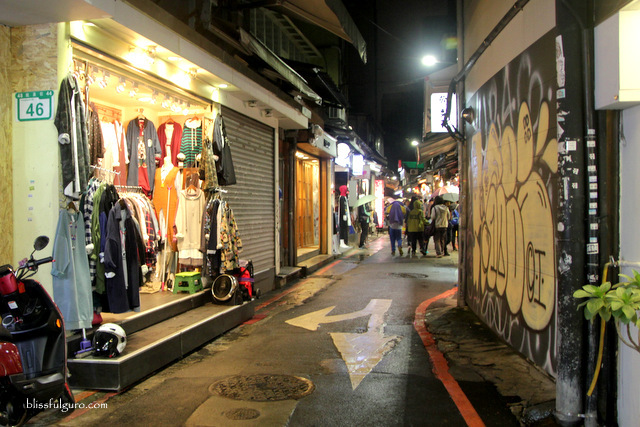 There was a main road that stems to other narrow alleys lined with artsy shops and restaurants. It was more of an upscale market with a younger crowd. As the clock ticked away, my buddies hurriedly shopped for winter clothes for their future jaunts while I enjoyed the street food around. And so we needed to run back to the hotel to pack our stuff and head straight to the airport afterwards with a promise to come back again to Taiwan really soon. 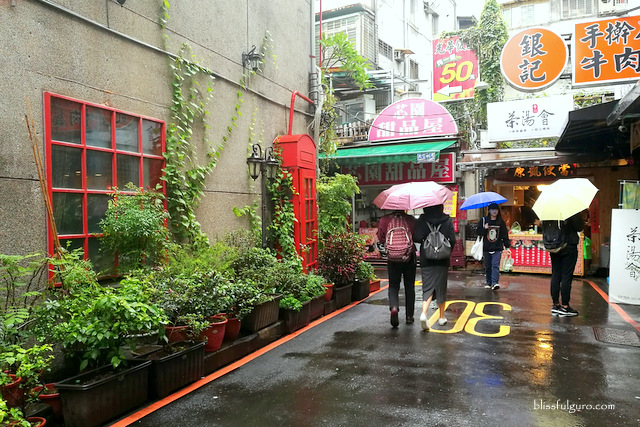 I can’t help but compare my travel experiences to similar urban jungles with Taipei. 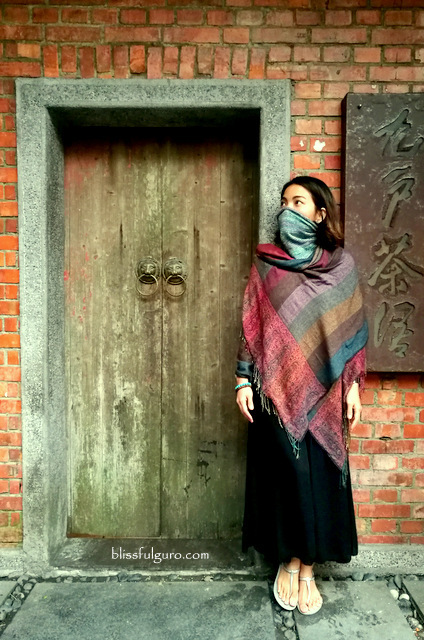 More than the authentic villages and oh so good street food, I love the gentleness of the Taiwanese people. No one seemed to be rushing to the point of knocking everyone out, they looked very chill. I like that. They are very warm and helpful. It seemed that they are actively and passively resisting to the radical industrial changes around them by exhibiting the proper and acceptable social skills. Something that its neighboring nations could emulate. On a lighter note, I suppose me and my buddy would be starting to have a detailed itinerary on our future trips for a better exploration, or may be not? Haha. 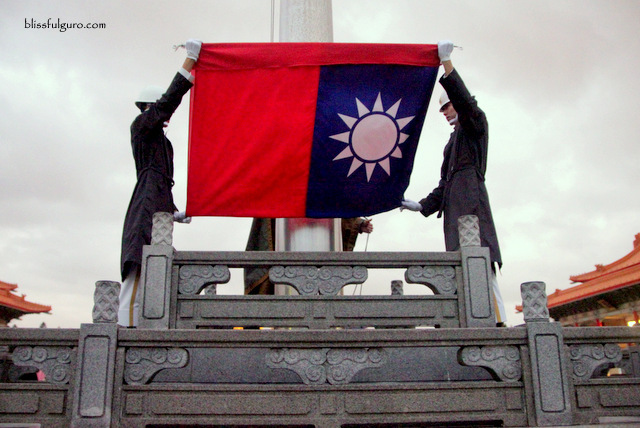 Your article on Taiwan made me really want to visit it pronto. But, I have to mention that you take great pictures, just impressive! Do you use a professional camera? In my case, I have to make do with my camera phone when taking photos for my Madrid blog. 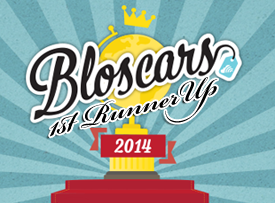 Again, Kudos to your wonderful blog. Very nice and well-written. I am going there March next year. 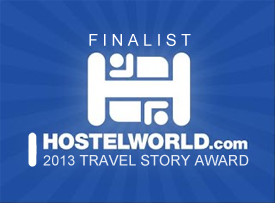 ^_^ Keep it up sis.